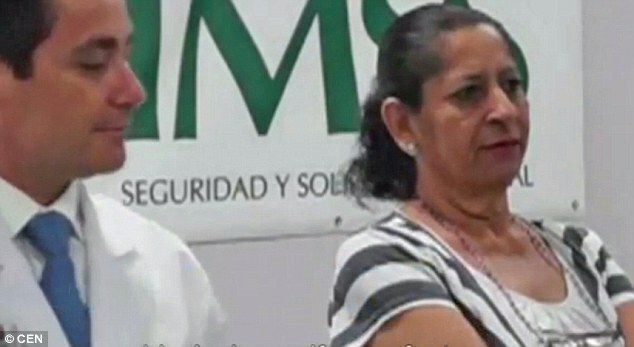 A Mexican woman was shocked to discover the reason she ballooned in weight - she had a 132-pound tumor on her ovaries. Mercedes Talamante said that when she first realized her weight had doubled, she thought it was a sign of her age. She became depressed due to her appearance as a result of the weight gain. Weeks later, after her daughter Maria advised that she see a doctor, she found out that she had a 132-pound tumor on her ovaries. The tumor reportedly grew for five years until it was half of her body weight. She was unable to move for 24 hours before she finally got it removed. When the tumor started growing, Talamante weighed 143 pounds. By the time she had the tumor removed, she weighed 275 pounds. The operation to remove the tumor was unprecedented, according to the director of the hospital where it took place. "We could not find any example of an ovarian [tumor] this big. There was no precedent anywhere in the world," Moises Aaron Nunez, director of Cabo San Lucas hospital, said, Daily Mail reported. The surgery, surgeon Gilberto Inzulza said, took four hours to complete but was ultimately a success. "I feel like a new woman. In fact after the surgery when I took my first steps, I felt like I was walking on air," Talamante said. The first thing she planned on doing when she returned home, she said, was to take her daughter out as a thank-you for saving her life. "This is not an unusual finding in pathology. They are comprised of many different types of cells. Many start as a ovarian cyst and the body produces fibrous elements to wall it off from the rest of the body. The size is unusual as is the weight, but I have seen many of these 40-60 lbs," one Daily Mail reader commented in response to the story. "Now I dislike going to the doctor but if my stomach started to grow for no reason. I sure hell wouldn't let it get that big," another reader wrote on The Shred's Facebook page. "Unbelievable! 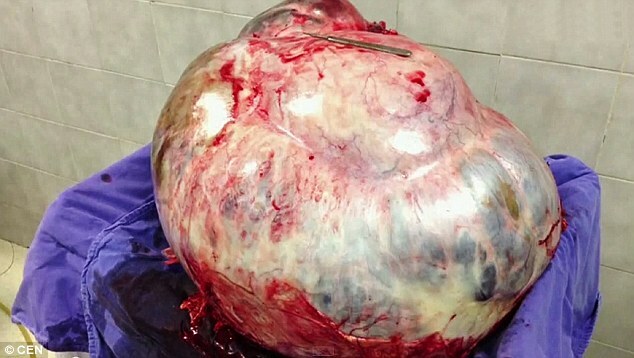 That is one hell of a tumour! I don't understand why people put off going to the doctors for help. In the article it says "with the Mexican woman barely able to move for the last 24 months". That's 2 whole years hardly moving and she STILL didn't go to the docs," another reader added. Other readers spoke to what the rare tumor was made of. "It is usually made of what we in pathology call mixed mesodermal and germ cell elements. fibrous tissue, ovarian cyst tissue, normal ovarian tissue, vascular tissue. They usually start as a body response to an ovarian cyst that ruptures or infarcts itself by overgrowing its blood supply. As the woman cycles the response becomes magnified and it sort of becomes an endless cycle. This is not an unusual benign tumour, very rarely some of the elements become malignant but they of a very low grade nature," one reader wrote.